Drs. Tony Povilitis and Dusti Becker encourage the Service to adopt a “can-do” approach by designating wild land areas and connecting open space corridors for special management and protection within historic jaguar range. Their 10-page report seeks to ensure that the habitat conservation program will be sufficient to actually recover the jaguar as a species. It’s an informative report, covering aspects of the US Endangered Species Act, the habitat needs of the jaguar, and the designation and protection of critical habitat. No doubt jaguars are in trouble worldwide. I see our effort as part of a broader movement to save wildlife, wherever, however we can. Best to put optimism or pessimism aside and just get to work! Cheers. SUMMIT COUNTY —A team of big-cat biologists and conservation scientists with the U.S. Fish and Wildlife Service have completed their outline for a jaguar conservation effort for Arizona and New Mexico, setting the stage for the release of a formal recovery plan late this year. Read all USFWS jaguar recovery planning documents at this USFWS website. Jaguars were listed as an endangered species in the U.S. in 1972. Internationally, they are listed as near-threatened on the IUCN Red List. According to some recent estimates, there may be as many as 30,000 jaguars total across their range in South America and Central America, with between 3,000 and 4,000 in Mexico. Populations thin out toward the northern end of the range, with populations in the Mexican states of Colima and Jalisco north through Nayarit, Sinaloa, southwestern Chihuahua, and Sonora to the border with the U.S. The most northern recently documented breeding population of jaguars occurs in Sonora near the towns of Huasabas and Sahuaripa, about 130 mi south of the border between the U.S and Mexico international. Jaguars historically ranged from the southern U.S. to Argentina, Belize, Bolivia, Brazil, Colombia, Costa Rica, Ecuador, El Salvador, French Guiana, Guatemala, Guyana, Honduras, Mexico, Nicaragua, Panama, Paraguay, Peru, Suriname, Uruguay and Venezuela. Currently, they range from the southwestern U.S. to northern Argentina, and are found in all countries except for El Salvador and Uruguay. In late 2011, a hunter photographed a jaguar in the wilds of southern Arizona, the first sighting in the U.S. since 2009. Historically, jaguars have been reported in California, Arizona, New Mexico, Texas, and possibly Louisiana . The last jaguar sightings in California, Texas, and Louisiana were documented in the late 1800s into the early 1900s, with the last confirmed jaguar killed in Texas in 1948. While jaguars have been documented as far north as the Grand Canyon, Arizona, occurrences in the U.S. since 1963 have been limited to south-central Arizona and extreme southwestern New Mexico. Three records of females with cubs have been documented in the U.S. (all in Arizona), the last in 1910 and no females have been confirmed in the U.S. since 1963. 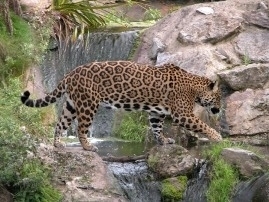 As a result, jaguars in the U.S. are thought to be part of a population, or populations, that occur largely in Mexico. No to low jaguar persecution/poaching by humans. Good habitat includes a high abundance of native prey, dense vegetative cover; rugged topography, including canyons and ridges, and some rocky hills good for denning and resting, and connectivity to allow normal demographic processes to occur and maintain genetic diversity. The recovery effort in the northwestern part of the range will include the U.S. and Mexico, but recovery will also be considered in a wider context, including the Pan American Recovery Unit which extends to Tierra del Fuego, Argentina. According to the recovery plan outline, both units are believed necessary for the recovery of the jaguar. The outline focuses on the Northwestern Recovery Unit, which encompasses much of the Sierra Madre Occidental in western Mexico including a management unit in Sonora, Mexico, southeastern Arizona, and extreme southwestern New Mexico. It identifies the recovery needs of the jaguar throughout its range, but focuses on the role that the northwestern population plays in the conservation of the whole species. It also identifies research needs, habitat types used by the jaguar, and threats to the northwestern population, and initiates discussions on the importance of habitat connectivity. The USFWS will publish a proposed critical habitat designation for the jaguar in the U.S. and seek public input later this summer.